Super Mario RPG: Legend of the Seven Stars (known simply as Super Mario RPG in Japan, sometimes referred to as Super Mario Role-Playing Game) is a role playing video game designed by Square (currently Square Enix) and released for the Super Nintendo Entertainment System in 1996. It was the first Mario role-playing game, with an action-command battle system. In this game, Mario, with the help of Mallow, Geno, Bowser, and Princess Toadstool (aka Princess Peach), needs to stop a new enemy, the Smithy Gang, while collecting seven Star Pieces so that peace may return and wishes may be granted once more. Super Mario RPG's success was limited due to the release of the Nintendo 64 and Super Mario 64 four months later that year. It was the last game in Square's original deal with Nintendo, and the final Mario game on the Super Nintendo Entertainment System. The game was later released on Virtual Console in Japan on June 24, 2008, in the PAL region on August 22, and in North America on September 1, 2008. In Europe, the game is treated as an import game, meaning that only the 60Hz mode is supported, and there has been no further localization. The game costs 800 Wii Points in North America and Japan, and 900 points in other regions. Super Mario RPG is also one of the 21 titles included on the Super NES Classic Edition. 8.2 Mario + 7 stars + 249 Virtual Console titles = ? Princess Toadstool in the intro. The game begins with a short cutscene. Princess Toadstool sits peacefully on a hill outside Mario's Pad. Suddenly, she is kidnapped by King Bowser using the Koopa Clown Car. Mario exits his house then and sees Princess Toadstool in peril. He chases Toadstool and Bowser and ends up at Bowser's Keep. After going through the castle, Mario finally catches up with Bowser, and proceeds to battle him on the chandeliers. Upon defeating Bowser and rescuing the princess, however, the castle begins to shake. A giant sword named Exor falls from the sky and crashes into Bowser's keep, destroying the Star Road on the way. The crash sends Mario, Toadstool, and Bowser flying in separate directions. Mario views the damage done to Bowser's Keep by Exor. Mario ends up landing back at his house where Toad has been searching for Toadstool. When Toad discovers that the princess is not there, he asks Mario to go back to Bowser's keep to bring her back. Mario has no idea where she or Bowser are, but goes to check the castle. However, when he arrives he is unable to enter the castle and Exor, the giant sword, tells Mario that the keep is now the property of the Smithy Gang, taken over to help with its quest to take over the world. Exor destroys the bridge and Mario narrowly escapes. Mario returns to his home. Toad gets kidnapped by two Hammer Bros. outside Mario's Pad. Mario defeats them and rescues Toad. Mario and Toad then travel to Mushroom Kingdom to inform the Chancellor of the Princess's kidnapping. After talking with the chancellor, he meets Mallow, apparently a frog from Tadpole Pond. Mario assists him by chasing after Croco, a thief, to recover a frog coin that was stolen from Mallow. When they return, the Mushroom Kingdom is dark and overrun by monsters. Mario and Mallow enter the castle and meet with Mack, a member of the Smithy Gang, in the throne room. Mario battles him and wins. After Mack is defeated, a star remains. Mario takes it, not quite knowing what it is. Mario and Mallow now head to Mallow's home, Tadpole Pond. On their way, which leads through the dark Kero Sewers, they encounter Belome, a giant, dog-like enemy. After Belome is defeated, the sewers are filled with water, and Mario is flushed down the Midas River. At Tadpole Pond, Mallow's grandfather Frogfucius reveals that he found Mallow floating in a basket as a baby, and is not really his grandfather. He tells Mallow to travel with Mario and find his true home. Bowser's remaining minions in Rose Way. Mario and Mallow then travel to Rose Town via the Rose Way. Bowser also happens to be at Rose Way at the same time. He has a group of minions with him and tries to get his castle back from the Smithy Gang. However, Mario and Bowser do not meet. As Mario arrives in Rose Town, it is under attack. Paralyzing arrows are shot from the nearby forest. The two seek shelter in the local inn. There, Mario plays with the innkeeper's son, Gaz, and his Mario, Bowser and Toadstool dolls. As the game continues, Gaz brings out his favorite doll, Geno. However, Mario is knocked out by a stray punch from the toy. While everyone is in bed, a star possesses the Geno doll and walks into the origin of the arrows, the Forest Maze. The next day, Mario and Mallow follow Geno's path through the Forest Maze, eventually meeting Bowyer, a bow-like creature who fires the paralyzing Aeros. Geno tries to get back the Star Piece that Bowyer holds. It is revealed that the Star Pieces are parts of the Star Road that has been destroyed by Exor. Without the Star Road, wishes are no longer granted. Unable to persuade Bowyer, who is a member of the Smithy Gang, Geno enters combat, and Mario and Mallow join him. Together, they defeat Bowyer and recover the second Star Piece. However, an Aero survives the battle. He hears about the Star Pieces' importance and heads off to inform Smithy. Bowser's remaining minions in Moleville. While Mario is free to go to Yo'ster Isle via the Pipe Vault, the next stop for Mario and his friends in their search for the Star Pieces is Moleville. Again, they happen to be there the same time as Bowser, but do not meet with him. The number of Bowser's minions has seemingly decreased since his time on Rose Way. The inhabitants of Moleville are upset because Dyna and Mite have been lost. Mario goes into the Coal Mines to find them. On his way through the vast caves, Mario jumps onto a spring board which pretends to be an exit. However, it's fake, and Mario is smashed against the ceiling. While unconscious, Croco appears again and steals Mario's coins. Mario chases Croco and the Crooks through the mines and eventually faces off against him. Halfway through the battle, Croco steals all of Mario's items. However, after his defeat, Mario and his friends regain the coins and the items. Going deeper into the mines, Mario meets the criminally insane Punchinello, who wants to defeat Mario in order to become famous. After a long battle, Punchinello drops a giant Bob-omb, which explodes and covers Mario and his friends with soot. However, they are able to get the third Star Piece, which Punchinello has found in the mines. Mario also finds Dyna & Mite, and they exit the mines through the mine kart track. Mario appearing near Booster Tower. Meanwhile, Princess Toadstool has fallen from the sky and landed at Booster Tower, the home to the maniacal Booster, who wants to marry her. However, she does not want to and cries out for Mario to help her. At the time, Mario and his friends, who had previously traveled through Booster Pass, arrive at Booster Tower. The entrance to the tower is locked. However, Bowser shows up again. All of his minions have deserted by this time. On his own, he decides to help out Mario and destroys the tower's front door. He then joins Mario and his friends by making them honorary members of the Koopa Troop. After heading to the highest level of the large tower, Mario enters Booster's room, right before the balcony where Toadstool is held captive. However, Booster enters and Mario hides behind curtains. Booster is looking for his Mario Doll, which he suspects to be somewhere behind the curtains. He and his Snifits search around. If they manage to find Mario while doing so, Mario has to then fight Booster. In both cases, Booster finds his Mario Doll and heads out to his balcony. Mario and his friends follow him onto the balcony. However, Booster and Toadstool have disappeared, and two helpers of Booster, Knife Guy and Grate Guy, battle Mario. After Knife Guy and Grate Guy are defeated, Mario continues to follow Booster, who is running up Booster Hill with Toadstool and tries to marry her in the wedding town of Marrymore. Mario disrupts the wedding and wants to take the princess back to the Mushroom Kingdom. However, the creators of the wedding cake, Chef Torte and his apprentice, are angry because of this and fight Mario. During the battle, their cake comes to life. After the fight, Booster eats the cake, and Mario and Toadstool go back to the Mushroom Kingdom. The Chancellor is glad about the princess's return. However, with the help of her grandmother, who is disguising herself as the princess, Toadstool is able to escape from the castle and join Mario's party. During a short visit at Tadpole Pond, Frogfucius tells Mario he has heard of a Star Piece falling onto Star Hill. Mario heads there instantly and finds the fourth Star Piece, unguarded. A screenshot of Seaside Town. Mario's next stop is Seaside Town. There, he gets told by the "Town Elder" that he saw a star fall into the sea. He asks Mario to get it for him. Mario, knowing that it is a Star Piece, heads off to the sea. He goes through the grottoes by the sea and finally reaches the shore. Underwater, he enters a Sunken Ship on the seabed. In the Sunken Ship, Mario soon reaches a door which is sealed and can only be opened with the right passwords. There are six rooms where Mario can find hints about the password. With the right word, he can open the door. He proceeds and encounters King Calamari, a giant Blooper who caused the ship to sink in the first place. After a battle with the monstrosity, Mario reaches the lower levels of the ship, and eventually meets Jonathan Jones, the shark owner of the ship. Jones claims the Star Piece for himself as it fell into "his" sea. However, Mario is able to win the Star Piece in a battle with Jones and leaves the ship. Upon returning to Seaside Town, Mario is stopped by the "Town Elder" and various other Toads. The "Town Elder" reveals himself to be Yaridovich, a spear-like member of the Smithy Gang. Yaridovich had disguised himself as Seaside Town's entire population in order to persuade Mario searching for the Star Piece for him. 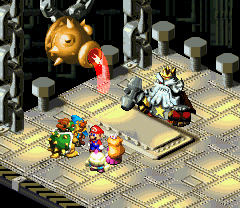 As Yaridovich threatens to torture the town's real population, Mario hands over the Star Piece. Yaridovich flees and Mario runs after him. Yaridovich was to be taken by the battleship Blade. However, Blade is late, and Yaridovich, being on a dead end cliff near Seaside Town, sees himself forced to swim, though he admits he might rust when doing so. However, Jonathan Jones jumps out of the water preventing Yaridovich from fleeing. Cornered, Yaridovich changes into his real form and battles Mario and his allies. 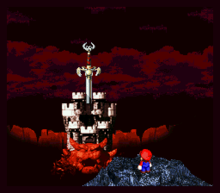 After a long fight, Mario is able to defeat Yaridovich and regain the fifth Star Piece. Looking for the sixth Star Piece, Mario and his friends travel to Land's End. After climbing the mountain and clearing the desert area, they are unable to proceed because the cliff is too high. So they search a way to the underground and end up in Belome Temple. There, they encounter Belome for a second time. The hungry dog monster tries to eat them, but again gets defeated. After the fight, Mario goes further underground and reaches Monstro Town. In Monstro Town, Monstermama calls Sergeant Flutter to help Mario climb the huge cliff in Land's End. She says that the sixth Star Piece has to be somewhere in the clouds, as there is no place on land left to look for it. With the help of Flutter and his Sky Troopas, Mario and his friends discover the Bean Valley. In a Warp Pipe in Bean Valley, a Beezo grows a giant Piranha Plant, the Megasmilax. Mario and company have to defeat it in order to gain access to the giant tendril which leads up to the clouds and to Nimbus Land. As Mario reaches Nimbus Land's plaza, Valentina is currently giving a speech to the local Nimbus. She says that King Nimbus is ill at the moment and cannot do his business. Also, she introduces the giant bird Dodo as being the lost Prince Mallow. Though Dodo looks nothing like a Nimbus and cannot speak, Valentina claims the "prince" wants to marry her, thus making her the queen of Nimbus Land. She then leaves for the castle, which is closed for the public. Though Mallow does not realize at first that he is the actual prince, he is told so by Garro, a sculptor for the royal family. Garro agrees to help Mario and Mallow against Valentina. He coats Mario in gold, disguising him as one of Garro's statues. He takes it to Nimbus Castle with other statues for Valentina. Inside, Mario barely escapes Dodo's wrath as he pecks on random statues instead of polishing them on Valentina's behalf. He takes off the statue disguise and fights his way through the heavily guarded castle. On their route through the castle, Mario and his friends encounter a giant Shelly, which turns out to be Birdo who is working for Valentina. After defeating her, Mario gets to the back door of Nimbus Castle and falls down a few layers of clouds. He quickly heads back to the plaza of Nimbus Land, where he meets Valentina and Dodo. After being defeated by Mario, Valentina falls through the clouds and, surprisingly, ends up at Booster Tower, just as Toadstool did before. Mallow is then reunited with his parents, King and Queen Nimbus. They say they heard a Star Piece has fallen into the nearby Barrel Volcano. So, Mario and his friends drop of the clouds from a specific place and fall right into the chimney of the volcano. The heroes fight their way through the hot volcano and take a stop at Hinopio's shop and inn. Shortly afterwards, they face a great wyrm known as the Czar Dragon, the guardian of the sixth Star Piece. They manage to defeat the fiery wyrm, but it resurrects and becomes the undead abomination, the dreaded bonewyrm Zombone. However, the bonewyrm is defeated. As Mario tries to collect the Star Piece, it is snatched away before his hands by the Axem Rangers. 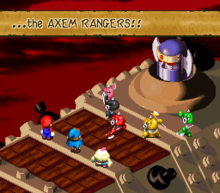 The Axem Rangers, five members of the Smithy Gang, run away with the Star Piece through Barrel Volcano, shortly followed by Mario and his friends. On top of the volcano, they head onto Blade, the huge battleship that failed to take away Yaridovich earlier. On Blade, Mario and company defeat all the Axem Rangers and also destroy the ship's Breaker Beam. Blade is destroyed, and Mario finally gets the sixth Star Piece. After meeting King and Queen Nimbus again, Mario and his friends take Nimbus Land's Royal Bus to get access to Bowser's Keep, which is unreachable through any other means because Exor destroyed the bridge to the nearby Vista Hill. All members of the Koopa Troop in Bowser's Keep have either defected to or been brainwashed by the Smithy Gang. However, many are scared off by their former boss Bowser. Mario meets Croco again, who does not fight him this time, but rather offers him help by selling his items. Mario then reaches a room with doors to six corridors, of which he has to clear four. Two corridors are action courses, two are fighting areas, and two are puzzle courses led by Dr. Topper. In the fighting areas, Mario can encounter enemies such as the Chester. All enemies in the fighting areas are created by a brainwashed Magikoopa and the statues. After the required amount of courses is cleared, Mario proceeds and fights the brainwashed Magikoopa. After its defeat, the Magikoopa comes to its senses again and helps out Mario's party, creating treasure boxes with unlimited coins as well as healing them. Croco also appears for a second time offering his items. Mario reaches the final room of the keep again, and gets onto the chandeliers he fought Bowser on at the beginning of the game. This time, the enemy is the Smithy Gang swordsman Boomer. After Mario and his friends defeat Boomer, he falls down. The chandelier with Mario on it is transported upwards by a Chandeli-ho to the highest tower of the keep. There, Mario's party finally enters combat with Exor. The giant sword foe is shielded by its eyes in battle. However, after the eyes are "knocked out", Mario and company can defeat Exor. With the mighty sword's last ounce of strength, Exor inhales Mario and his party with its mouth, the Neosquid, which acts as a portal to Smithy's dimension. Mario, Mallow, Geno, Bowser and Toadstool are brought to Smithy's Factory, his base of operation for the invasion of Mushroom Kingdom. In the gloomy universe, they have to fight many previous enemies a second time. Notably, Machine Mades, which are gray copies of Mack, Bowyer, Yaridovich and the Axem Rangers, are produced en masse in the Factory. Additionally, they encounter Count Down, a giant clock which is controlled by the bell-like Ding-A-Lings. They also fight the duo of Cloaker and Domino. When either one of them is defeated, the other runs away to make use of his giant snake. Domino's snake is Mad Adder, while Cloaker's is Earth Link. However, even with the help of the snake, he is defeated by Mario. Mario and company then enter the production lines of the Factory. There, they have to fight the Factory's Clerk, Manager and Director before meeting the Factory Chief. The Factory Chief is using the Gunyolk in battle. However, he still is defeated by Mario. Mario and gang meet Smithy. The five heroes finally meet Smithy at the basement of the Factory. Smithy is constantly creating more weapons with his hammer and the Smelter. He also holds the seventh and last Star Piece. Refusing to give it away, he starts to fight Mario and his allies. At first, he use the Smelter to create Shypers to aide him in battle. However, he is soon defeated. Angry, he slams the floor with his hammer several times. 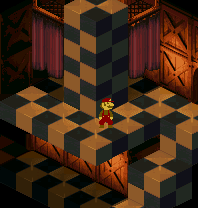 Because the floor has only been constructed the day before, it breaks and Smithy, along with Mario and company, falls down to a dark area below the Factory. Furious, Smithy changes into his real form for the final battle. With his hammer, he has the power to transform his head into five different forms, all with special abilities. However, after a long battle, he is defeated and destroyed by Mario and his friends. 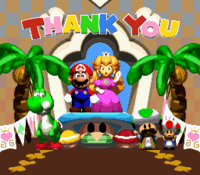 The ending screen with Mario, Princess Toadstool, Yoshi, Toad, and the Chancellor. With all seven Star Pieces restored, Geno thanks the others and says goodbye, before leaving the form of a doll and returning to a small star. The Star Road is restored, and Mario, Mallow, Bowser, Toadstool and the Geno doll are returned to Mario's World. Exor dissolves into thin air. Mallow is crowned the prince of Nimbus Land. Bowser repairs his keep with the help of his minions. Jonathan Jones looks out at the sunset from the cliff where the Yaridovich battle took place. Croco is seen racing the Mushroom Derby against Yoshi. Though he loses this race, he is consoled by Boshi and the two walk off together (seemingly establishing a friendship). Frogfucius and his Student both attend a concert held by Toadofsky. Valentina and Booster get married with Dodo exchanging vows. However, Booster runs off and Valentina follows, leaving Dodo confused. Mario and Princess Toadstool return to the Mushroom Kingdom, thanking the player for all of the hard work. As the credits roll, there is a parade featuring every character in it. In his only appearance in the game, Luigi is the parade grand marshal. During their adventure, Mario and his friends are free to visit several optional places in the world. The biggest of them is Yo'ster Isle, the home island of the Yoshis, which can be reached via the Pipe Vault between Rose Town and Moleville. The Pipe Vault is held in the traditional side-scrolling manner of earlier Mario games such as Super Mario Bros., and features classic enemies such as Piranha Plants. On Yo'ster Isle, Mario meets Yoshi and can ride him. On Yoshi's back, Mario is able to talk to other Yoshis on the island, with Yoshi translating their words from the Yoshi language. On Yoshi's back, Mario can compete in the Mushroom Derby, a racing minigame, against the island's champion, the rude Boshi. Entry into the derby requires Yoshi Cookies. After winning the Mushroom Derby, Mario has access to Yoshi Cookies outside the island. He can summon Yoshi in battle, who swallows smaller enemies, leaving back a certain item or a Yoshi Candy. Another optional place to visit is Grate Guy's Casino, which opens after Mario's quest to Nimbus Land. To enter it, Mario has to get the membership card by Knife Guy in Booster's Tower, then find the secret entrance to the casino in Bean Valley. The casino offers several minigames to win coins. In Monstro Town, there is a sealed door. Mario only can open it with a Shiny Stone, which he can get from a girl mole in Moleville if the player gives her fireworks, which they can get from a male mole in Moleville for 500 coins. When they open the door, the player then meets Culex. 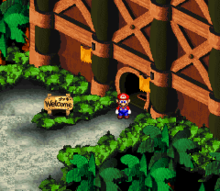 After the party's adventures in Marrymore, the player can return to the Mushroom Kingdom, find the Inn, and talk to a young Toad in the corner. After talking to him several times, he sells Mario a minigame, Beetle Mania, for 500 coins. HP, or hit points, show the amount of damage a character can take. When it reaches 0, the character is knocked out and unable to fight unless revived. Having the entire party knocked out means Game Over, but the player automatically restarts from his/her last save. Speed affects how often and in what order the character fights. Characters with a high speed attack before any other allies or enemies, and could attack multiple times before another character attacks once depending on their speed. Attack is the physical strength of the character. Combined with the character's weapon, it adds up to a final value that affects how much damage they deal to an opponent with physical attacks. Defense, combined with the character's armor, reduces the amount of damage a character receives from an enemy's normal physical attack. Magic Attack affects the strength of a character's special skill. Magic Defense is similar to defense, but only protects against enemies' special skills, not regular attacks. In addition, each time a character levels up, they can choose one of three groups of stats to gain a bonus in: attack and defense, HP, or magic attack and magic defense. Special skills can be performed by using flower points, or FP. These flower points are not raised by leveling up, but by special items such as the Flower Tab. Occasionally and at random, an item is used without being consumed as normal, called a "freebie" by the game. Attack, which allows the character to perform a basic attack using the weapon they have equipped. Item, which allows them to use one of the items they have on themselves, an ally, an enemy, or a group of allies or enemies depending on the item. Special, which allows the character to use one of the special moves they have acquired by leveling up. Etc., which gives the character the option of defending, ensuring they receive less damage if they are hit by enemy, or running away, which may or may not be possible depending on the enemy being fought and random chance. Many of these options can be improved by the "Timed Hit", which helps them in many ways when the player presses any button at the correct time. Depending on the timing, these commands can increase physical damage by 1.5x if done okay, or 2x if done well. They can also block half damage from physical damage if done okay, and ALL of it if done well. Magical attacks can be timed as well for more damage. However, any enemy magic attack (and some physical attacks) cannot be blocked in this manner. In addition, a correctly Timed Hit with an Item can result in a "Freebie", meaning that an item is used, but not consumed from the inventory. However, the timing window for doing this is very narrow. After defeating an enemy, the character who defeated it occasionally receives a flower that gives them a special bonus. Through enough stat bonuses after battling, each member of the party can reach a maximum level of 30. In battle, Mario uses powerful attacks, hitting his enemies with various Hammers, Koopa Shells or simply his hands. His magic attacks involve jumping and fire magic. When Mario falls in battle, his allies can still fight on and win the battle for him. Mallow is, at first, believed to be a simple tadpole from Tadpole Pond even though he looks nothing like one. He is the first partner Mario meets, joining Mario during his first visit to the Mushroom Kingdom. He was raised by Frogfucius who found him floating in a basket as a baby. Later, when Mallow and Mario visit Frogfucius, it is revealed that Mallow is not a frog and that his real parents are out there, somewhere. Late in the game, Mario and his party visit Nimbus Land, whose citizens are all of the same species as Mallow. There, Mallow discovers that he is a prince and his parents are King Nimbus and Queen Nimbus. He has a variety of attacks useful for attacking all of the enemies at one time. He has powerful control over the weather: outside of battle, when he cries, a heavy rainstorm starts. In battle, he can summon things from lightning to snow to a healing rain. In addition, he has a harmless but useful attack, Psychopath, that shows how much HP an enemy has remaining and a quote from the enemy's mind when the player manages to do a Timed Hit. Geno is the second to join. He is from Star Road, and, while his real form appears to be a small star, he takes the form and name of Gaz's doll while with Mario. He reveals to the party what the Star Pieces discovered by Mario are and their importance. He is incredibly powerful and has a variety of offensive attacks, one of which (Geno Whirl), can deal 9999 HP of damage on regular enemies, Yaridovich clones, and Exor. Bowser, for the first time in the series, joins Mario's side. His goal was to take his keep back from Smithy's gang. He and Mario reluctantly join at Booster Tower. He does not have as great a variety of special attacks as the other members of the team, though he is physically incredibly strong. Princess Toadstool is the last to join. She was kidnapped at the beginning of the game, and, right when Mario rescued her, was sent flying off. After falling from the sky, she was discovered by Booster and held in his tower. Booster attempted to marry her, but she was eventually rescued by Mario and returned to the Mushroom Kingdom, apparently to stay. However, with the help of her grandmother, who disguised herself as the princess, Toadstool sneaked away to join Mario's party. Her special skills are mostly defensive (with two crowd control spells in her mix) and healing, not offensive. Her healing skills can be incredibly useful, she can resurrect a fallen partner, and she can make a battle against tough foes and large crowds easier by putting them to sleep or by muting spell casters. 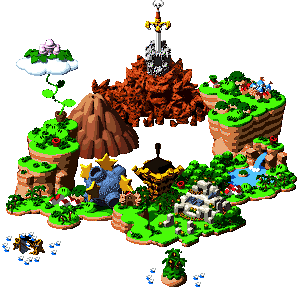 Mario and his party visit many places over the course of the game. Bowser's Keep - It was once Bowser's home, but it is taken over by the Smithy Gang early in the game. Vista Hill - The area that was once connected to Bowser's Keep via bridge, but Exor, the sword who crashed into Bowser's Keep, destroyed the bridge. Nothing of interest here. Mario's Pad - Mario's home, it includes tools and a pipe for a smokestack. This is where Mario's adventure begins and has free resting. Mushroom Way - A short road leading from Mario's Pad to the Mushroom Kingdom. Mushroom Kingdom - A small town. This is where Mack and a group of Shysters take over. The first star is found here. Bandit's Way - A longer road coming off of the Mushroom Kingdom. It leads nowhere, but it is where Mario and Mallow fight Croco for the first time. Kero Sewers - A large sewer system located above the falls. The Big Boos and other enemies inhabit it, and the end is guarded by the doglike Belome. Midas River - A large river fed by Midas Waterfall. Tadpole Pond - Home of Frogfucius and once the home of Mallow. As the name implies, many tadpoles inhabit it. Two of them have started shops. Toadofsky, a composer, also lives nearby. Rose Way - A short, watery road from Tadpole Pond to Rose Town. Many Crooks inhabit parts of it. Rose Town - A town that is being attacked by arrows. If an arrow hits one of the people, they become paralyzed. Forest Maze - A large, winding forest near Rose Town inhabited by enemies. Bowyer, a member of the Smithy Gang, resided in it. The second star is found here. Pipe Vault - An optional tunnel system leading to Yo'ster Isle. Along with the pipes and tunnels, there are dangerous areas of lava inside. Yo'ster Isle The home of the Mushroom Derby. As the name implies, many Yoshis live there along with a blue Yoshi in sunglasses named Boshi. Moleville - A small town inhabited by moles. Coal Mines - Tunnels in Moleville's mountain that are infested by monsters up to the deeper areas. Punchinello is found here and seeks fame and fortune at the expense of others. The third star is found here. Booster Pass - The road between Moleville and Booster Tower used for Apprentices. Has a lot of rock and Artichokers. Booster Tower - Home of Booster and his Snifits and been in his family for generations. He closed off the tower from visitors because of Princess Toadstool. Booster Hill - A hill between Booster Tower and Marrymore. Not much of anything here, except beetles and barrels. Marrymore - As its name implies, this is where people go to a chapel to be wed.
Star Hill - The place where wishes that have been granted fall to Mario's world. Due to Smithy destroying the Star Road, some ungranted Wish Stars fell, as well. Flowers open doors around here. The fourth star is found here, unguarded. Seaside Town - A little town that is taken over by Yaridovich for a short while. Sea - A blue-gray tunnel going from Seaside Town to the Sunken Ship. It has a shop and water. It eventually leads to the Sea where Mario enters the Sunken Ship. Sunken Ship - A ship that sank off the coast of the Sea Passage. It is home to Dry Bones, Greapers, and puzzles. King Calamari and Jonathan Jones also call the Sunken Ship home. The fifth star is found here. Land's End - An area that got its name from the landform near Bean Valley. Pot Cannons are the main means of transportation, which then give way to whirlpools of sand. It also houses a passage to Kero Sewers. Belome Temple - A temple that is under the sands near the end of Land's End. The path depends on the player's fortune. Belome is fought at the end with the right fortune and he gains the ability to eat any ally and clone them to fight for him. It leads to Monstro Town. Monstro Town - The home of reformed monsters. Bean Valley - This place relies heavily on a maze of pipes to get around. It also leads to Grate Guy Casino. Grate Guy's Casino - A casino that requires a Bright Card to get in. It has slot machines, guess the hand, and blackjack as games. Operated by Grate Guy, the younger brother of Knife Guy. Nimbus Land - This is where Mallow's real family is, and also where Valentina took over. Barrel Volcano - A volcano that powers the hot springs in Nimbus Land. Lava covers much of this volcano and there are very dangerous enemies here. It also houses two shops and an inn. The Czar Dragon rules over the sixth star, but is stolen by the Axem Rangers. Factory - Where Smithy lives. Machine Made replicas of Smithy Gang members are constantly produced here. The seventh and final star is found here. 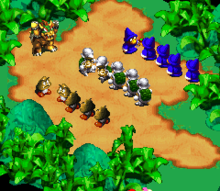 Mario encounters many adversaries during the course of Super Mario RPG: Legend of the Seven Stars; the main antagonists are the Smithy Gang, members of which are listed in bold below. Unlike the Paper Mario series, there are no definable "chapters", and therefore there are no definable "chapter bosses"; any significant enemy with higher HP is considered a boss. One attack used by many bosses, Flame Wall, looks radically different from the original game. In the original version, a wave of red, orange, and yellow flows to the left of the screen. In the Virtual Console version, the wave is separated, only red, and somewhat faded. Also, Static E! is changed from a bright, blue & white flash to a deep blue one. This was changed in order to avoid players possibly having seizures. Also, Moleville has a considerably darker color scheme. Otherwise, the game was not localized. This means keeping the American SNES dark/light purple button layout in battle mode and against Bowyer, while the European SNES has the / / / buttons colored as in the Japanese version. For the PAL version, Bowser's victory pose was changed to the North American version because the original has Bowser giving a gesture which is viewed as saying "Up yours" in most of Europe. Set in the Mushroom Kingdom and featuring its cast of well-known characters, this adventure RPG begins with a familiar scenario. Mario™ must rescue Princess Toadstool™ from Bowser™. However, a mysterious new enemy named Smithy soon appears, and Mario and Bowser are forced to fight as allies for the first time in their long history. In the quest to defeat their powerful new foe, they'll journey across a wide variety of locations (a town of mining moles, a tropical forest, a thundering waterfall—just to name a few) and tackle a mix of obstacles requiring both expert timing and strategy to overcome. Along the way, they'll gain experience and grow more powerful, while also meeting new characters whose unique abilities will be needed to take on Smithy and his gang. Striking a perfect balance of traditional RPG elements and the action-packed game play Mario is famous for, it's easy to see why this title has earned "legendary" status! Mario + 7 stars + 249 Virtual Console titles = ? The launch of the 250th title available on Virtual Console™, of course! And what better game to mark the occasion with than the eagerly anticipated Super NES™ game, Super Mario RPG: Legend of the Seven Stars™? Whether you're celebrating the Labor Day holiday, relishing the last few days before school begins, or just looking for a brand-new retro title to enjoy, this is one game sure to please. By combining the magic of traditional Mario™ titles with the renowned design skills of Square Enix, Super Mario RPG satisfies fans across the board. So if you've been waiting to take on Smithy again or never even knew that Mario and Bowser™ were once allies, now's the time to experience one of Mario's grandest adventures! Still want more info on Super Mario RPG? Then be sure to watch the video now available on the Nintendo Channel for a sneak peak on what the game has in store for you. Also make sure to check out the other Virtual Console titles available for download. You won't find a more complete assortment of games from your favorite systems and genres available in one spot. From classic franchises to previously unavailable imports, you'll be sure to find titles that suit your gaming tastes! Super Mario RPG: Legend of the Seven Stars™ is rated Everyone by the ESRB. : The Mushroom Kingdom faces a new threat when a giant sword falls from the sky and lays chaos upon the land. Mario must gather a crew of unexpected allies to take on the nefarious Smithy Gang! Before Paper Mario™ and Mario & Luigi™, the first Role-Playing Game featuring Mario was this celebrated collaboration between Nintendo™ and the makers of Final Fantasy™, Squaresoft™ (now Square Enix™). Many players hold fond memories of the witty dialogue and colourful characters such as Mallow and Geno. If you own this title on your Wii™, perform a system transfer from your Wii to your Wii U™ to receive a special upgrade price. Mario with an opened Surprise Box in the Rose Town Item Shop. 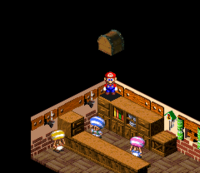 In Super Mario RPG: Legend of the Seven Stars, Mario can discover hidden treasure boxes known as Surprise Boxes throughout the Mushroom Kingdom. There are 39 Surprise Boxes in the game. For listings of Shops, Weapons, Armor, Accessories, General Items, Special Items, Special Moves, Level Up Progressions and Bestiary, see the respective pages. 8-bit Mario, seen in Booster's Tower. Link can be found sleeping in the Rose Town inn after beating Bowyer in the Forest Maze. When talked to, a jingle that normally sounds when a secret is discovered in the The Legend of Zelda series plays, along with a text box saying ".....", referencing Link's normally silent role in his games. Samus Aran can be found sleeping in the guest bed of Toadstool's Castle after beating Yaridovich and obtaining the 5th Star Piece, and remains there until the player goes to Bean Valley. When spoken to, she'll say she's resting up for Mother Brain, the final boss of the Metroid series. A Samus action figure can be found in a toy box in Booster Tower. Hinopio in the Barrel Volcano has models of Captain Falcon's and Samurai Goroh's spacecraft, and an Arwing from the Star Fox series. Culex (and his Crystals) is an optional boss designed to resemble the Final Fantasy bosses. During and after the battle with him, Final Fantasy music is played. The music heard is a rearrangement of the Boss Battle theme in Final Fantasy IV and after the battle, the famous Final Fantasy Victory Theme plays. Donkey Kong look-alikes, known as Guerrillas and Chained Kongs appear in the Forest Maze and Barrel Volcano. One action sequence in Bowser's Keep involves climbing a ledge while avoiding barrels by jumping, defeating a Guerilla at the top. This is a direct homage to the original Donkey Kong arcade game. For a short period of time, Mario can turn into a 8-bit version in the Booster Tower. This can only happen once. The enemy Bahamutt is named after the powerful dragon Bahamut from the Final Fantasy series. Another reference to the Final Fantasy series involves the Czar Dragon: an optional boss of the same name was dummied from Final Fantasy VI. Hidon aboard the Sunken Ship is named for another Final Fantasy VI boss. The music score was released as a CD only in Japan as Super Mario RPG Original Sound Version. The Super Mario RPG Original Sound Version is a Japan-exclusive soundtrack product that was released on March 8, 1996. All the tracks listed in this page were composed by Yoko Shimomura. For a complete list of media for this subject, see List of Super Mario RPG: Legend of the Seven Stars media. 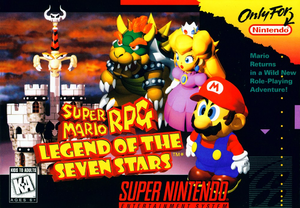 Super Mario RPG: Legend of the Seven Stars was developed by Squaresoft, with directing duties being split between Chihiro Fujioka and Yoshihiko Maekawa. Yoko Shimomura composed the soundtrack. Several members of the staff, including the aforementioned composer and directors, would later join AlphaDream and work on the Mario & Luigi series. The game was the last work of noted videogame translator Ted Woolsey at Squaresoft. Material from an early Nintendo Power shows that the Chancellor was once designed differently, being a more elderly-looking, gray-spotted Toad with a beard. It also showed that at least one Buzzer would be in Mushroom Way, and that Frogfucius's island at Tadpole Pond would be closer and therefore accessed differently. A green Jester-like enemy named Harlequin. A Blue colored Fautso named Baba Yaga. An enemy that resembles a purple Bahamutt with sunglasses. A red Spikey named Super Spike. A white version of Carroboscis named Radish. A blue version of Stumpet named Lumbler; Lumbler has a move set. It has the moves Crystal and an egg shooting attack it shares with Birdo. A blue, glitchy Corkpedite named Pile Driver. Chompweeds were originally going to be enemies that Mario would have fought, but they were changed to obstacles. A blue colored Mastadoom named Mastablasta, that could summon Goombas; its psychopath thought is "Life is tough, ain't it?" When the player gets to the room where Mack is faced, instead of going straight to battle him, the player can jump on top of the Shysters on the left side, and carefully walk on them. If the Mack scene does not trigger when the player falls off them, the glitch has been performed correctly. The player must then walk to the Chancellor in the corner, and talk to him to finish the glitch. Wii Lucas M. Thomas, IGN 9.5/10 "So it's absolutely undeniable that Super Mario RPG is worth its asking price of only 800 Wii Points, as it's a classic, deep, fun and cult-appealing installment in the Mario series that no Nintendo gamer should go without playing. Nintendo saved itself a winner to take the honor of the "250th Virtual Console Game" title, and you shouldn't hesistate to download it right away -- because in addition to getting yourself a great game for a great price, you'll also be showing further support for those other seemingly forgotten games that the fans are still crying out to see come to the VC." SNES Corbie Dillard, Nintendo Life 10/10 "Whether you're an RPG fan or not, you really owe it to yourself to give this legendary RPG classic a try. Who would have thought that putting Mario into a traditional rpg setting would end up working quite so well. As good as Super Mario RPG was back when it was first released, the game only seems to have gotten even better over time and is a true testament to what Square and Nintendo were able to accomplish with this absolutely amazing and timeless RPG classic." Though no direct sequel to Super Mario RPG would see release, the next role-playing Mario game, Paper Mario, was announced under the title Super Mario RPG 2 and the final game would retain multiple links to Super Mario RPG such as the Action command mechanic, the ending credits being presented as a parade, Star Hill and the character of the Chancellor (though both were given a different name in the English translation), the concept of optional boss battles against a martial artist who is fought three times, and more. When asked in a 2013 interview if he was interested in making a direct sequel to the game, the game's co-director Yoshihiko Maekwawa responded that he felt Super Mario RPG accomplished what he set out to do and that he personally had no interest in revisiting the world or its characters. Donkey Kong: One action room in Bowser's Keep involves Mario avoiding a Chained Kong who throws barrels, similar to Donkey Kong in this game. Super Mario Bros.: When Mario walks behind a curtained section in Booster Tower, he emerges as Mario appeared in this game. A soundclip from the game is played, and when he tries to exits the room the 'time running out' sound plays as he shrinks and runs back behind the curtain. If the player uses the bathroom in Marrymore, an arrangement of the game's theme plays. Super Mario Bros. 3: The music that plays in the battle against Bowser is a rearrangement of his theme from this game. The music that plays in Bowser's Keep also has a part of the same theme. Also, some of the Grass Land's theme is heard in the Flower Garden cutscene and for Mario's Pad. Super Mario World: When Mario enters the Rose Town inn for the first time, an arrangement of the overworld theme plays. Another cover of this theme plays when Lulla-Bye is used on a party member. Also, the Crescent Moon from Star World is shown in the background of the Star Road during the ending before the credits. The Koopa Clown Car reappears in the introduction cutscene, too. Mario Party: Part of the first Bowser's Keep theme is a rearrangement of Bowser's Magma Mountain's. Wrecking Crew '98: Mario's House appears as it does in Super Mario RPG. Paper Mario: The end credits feature a parade of most of the characters, led by Luigi; this is a reference to the credits of Super Mario RPG. Additionally, throughout Paper Mario, there are many other elements that were lifted from or influenced by this game; for more information, see here. Super Mario Advance 4: Super Mario Bros. 3: The theme for World-e Castle bears a strong resemblance to "Hello, Happy Kingdom!" Mario & Luigi: Superstar Saga: A Geno doll appears. Plus, a short arrangement of the Mario's Pad theme can be heard near the beginning of the game and in the Warp Pipe zones. Mario Power Tennis: Bowser's Keep appears as it does in Super Mario RPG in the background of Bowser's Castle Court. Mario & Luigi: Partners in Time: One of the special attacks is kicking a Koopa shell, akin to Mario's NokNok Shell weapon. The first Cobalt Star shard is found in a Super Mario RPG-style treasure box. 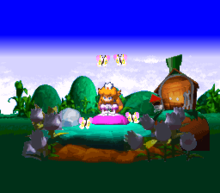 Mario Hoops 3-on-3: Peach's castle appears at it does in Super Mario RPG in the background of Peach Field. Also, this game was developed by the same company after merging with Enix, which the two companies together became known as Square-Enix. Mario & Luigi: Bowser's Inside Story: Bowser's Castle and army is taken over again. When being on a particular platform near Bowser's Castle, the character looks at the castle from far, similarly to how Mario does in Super Mario RPG if he goes to Vista Hill. The theme used in Peach's Castle after Fawful's takeover is also a rearrangement of the "Forest Maze" theme. Lastly, there is a very similar line in this game about Chippy (known as Starlow to Mario and Luigi) joining the Koopa Troop. Fortune Street: The Mushroom Kingdom map music (with Princess Peach's Castle in the background) contains a rearrangement of the music from this game. Super Smash Bros. Melee: Peach's side smash attack cycles through a golf club, a tennis racquet, and a frying pan. The Frying Pan is a weapon she can equip and use in battle, purchased as the "Iron Plate" in Moleville. Her dress with the fiery patterns may have been inspired by the Fire Dress armor that can be purchased from Barrel Volcano. Super Smash Bros. Brawl: A deleted theme from the game is possibly a rearrangement of the "Forest Maze" theme, titled "Beware the Forest's Mushrooms." Paper Mario: Sticker Star: Another end credits parade commences. Again, Luigi leads it. Super Smash Bros. for Nintendo 3DS / Wii U: A downloadable Mii Fighter costume appears based off of Geno. Super Smash Bros. Ultimate: Geno appears as both a spirit and a Battle Arena counter icon, and Mallow also appears as a spirit. Chewies and Megasmilax are mentioned in Piranha Plant's Palutena's Guidance. Yoshi's Crafted World: A bag of cookies called "Yo'ster Cookies" can be found, referencing Yo'ster Isle. 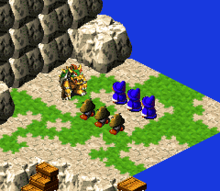 For this subject's image gallery, see Gallery:Super Mario RPG: Legend of the Seven Stars. The instruction booklet does not list any battle statistics about Princess Toadstool, who is the fifth and final member to join the party. This is also the only SNES Mario game released outside of Japan not to have European and Australian releases until it was re-released on the Wii Virtual Console years later. The Japanese version's copyright year says 1995 on the title screen, even though it was released on March 9, 1996, 65 days before its North American release. This is corrected in the North American version. The Save Block's letter S's appears in serif format in the official artwork, but in the game has the letter S's in sans-serif format. This is the first Mario game with some Toads being identified as females prior to recurring ones like Toadette who was later introduced in Mario Kart: Double Dash!! in 2003. ↑ Super Mario RPG's Virtual Console page, accessed 2008-06-02. ↑ @MarioBrothBlog on Twitter. Posted Feb 13, 2019. Retrieved Feb 14, 2019. This page was last edited on April 19, 2019, at 02:46.